A TRY with the last move of the game kept alive Plymouth Argaum’s hopes of retaining the Lockie Cup. The newly-crowned Devon One champions were trailing Devonport Services seconds 21-20 going into injury-time in a controversial cup semi-final at The Rectory. Dave Sansom’s team had been 21-15 down with 79 minutes on the clock but pulled a try back with Dan Smith getting the ball down from a maul in the 80th minute. Services thought they had won when the visitors missed the conversion. However, the referee decided there was plenty of injury-time to add on in a game that saw the home team collect two red cards and three yellow. And Argaum took advantage with Smith forcing his way over again from close range in the eighth minute of added-on time. It would have been harsh if the visitors hadn’t won as they were deprived of their best weapon – their scrum – for a large part of the match. Services probably would not have been in front going into the final few minutes had the game not gone to uncontested scrums. The visitors had taken a 3-0 lead with a Richie Hewitt penalty before lively Services scrum-half Jay Samuel scored a great try near the posts to make it 7-3. Argaum went 10-7 up with a penalty try after a host of powerful scrums inside the 22. However, from the restart Argaum had their clearing kick charged down by Services winger Kala Bainivalu, who pounced on the ball to score a converted try and make it 14-10. Argaum, though, looked the dominant side. Services had quick and lively backs who looked dangerous whenever they got the ball, but they struggled to get it as Devonport just could not handle the visitors’ scrum. The Bickleigh Down side looked like they were going to score a second try before the referee lost patience and issued his first yellow card. Devonport had no replacement prop and so the game had to go to uncontested scrums, with Services taking another player off. But, forfeiting a man for uncontested scrums, actually worked in their favour. Argaum knocked on attacking their line from the penalty and Services scored from the resultant uncontested scrum, with the impressive Samuel running in from his own half to make it 21-10. It was harsh on Argaum, but on the stroke of half-time Services had Brian Ncube sent off. David Hall reduced the gap with a try after the break before Services’ Ben Harper was sin-binned for a professional foul. While the fly-half was off the field, Services won a penalty inside the 22 but they were unable to kick it with Harper missing. That kick would have put the home side two scores in front. It looked like time was going to run out for Argaum before their drive try that set up a thrilling final few minutes that saw Services have another player sin-binned and eventually Smith scoring the winning. On the whistle it is believed the referee issued another red card to a Devonport player. Last year’s winners Argaum will play Ivybridge IIs in the final at the Rectory on April 29. 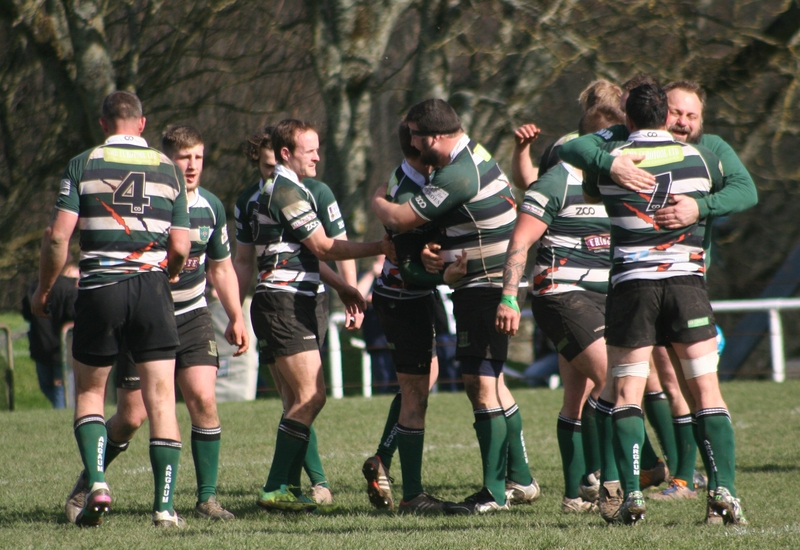 Ivybridge narrowly overcame Plymstock Albion Oaks 11-10 at Horsham Playing Fields. Tags: Argaum, Devonport, Lockie Cup, Plymouth, Rugby. Bookmark the permalink.